My husband and I have great hopes for our children. We dream of what their futures will be like. We work to provide opportunities that help them grow and develop. We want them to be happy and healthy and successful. We all have hopes and dreams for our children. Don't we? We wait for them to join our family, and then have visions of how we hope their lives will go. But what happens when our dreams for our kids, and for our families, don't come true, or can't come true? When our vision for their future is interrupted for what-ever-reason? I have been thinking about this a lot lately after recently reading "The Anti-Romantic Child, A Memoir of Unexpected Joy", by Priscilla Gilman. Priscilla was a new mom with her own ideas of what children and childhood should be like. She was a professor at Yale, writing her dissertation, trying to get tenure. And then her first child, Benjamin was born. Just like you and me, Priscilla had hopes and dreams for her son. But as Benjamin grew, his brilliance was associated with a developmental disorder that would dramatically alter the course of Priscilla's dreams for her son and her family. As Benjamin gets older, she has to continually deal with the fact that her own expectations would never be met. Priscilla teaches Romantic poetry and uses excerpts from Wordsworth's poetry to mourn the loss of the romantic child she though she would have. She comes to realize the need to re-imagine the expectations and hopes she had for her children, her family and for herself. She finds joy in a very unexpected life, she never dreamed of. Although we might not all deal with a child who has special needs, like Priscilla, we will all deal with unexpected, and unfulfilled hopes and dreams. We all deal with realizations that our lives are not going how we had always planned. Maybe our husbands loose their jobs and we are faced with the uncertainty of employment. Maybe we can't have children, or our relationships don't go as planned, for whatever reason. Maybe we dreamed our kids would be athletes, but they don't like sports. Or maybe our daughters don't want to follow in our footsteps and play the violin. We think for so long, that the joy in our lives will come from seeing our dreams fulfilled. We think that our joy will come from our children turning out just like we dreamed. But the fact of the matter is that if we are always waiting for our dreams to come to pass, we miss out on living life as it is now. We miss out on the children in front of us, and the world around us. We can get so busy looking for the perfect children, doing perfect things, that we miss out on loving the children we have been given. All of our children are perfect. They are perfect for us and for our families. They all fulfill our hopes and dreams, they are just dreams we might not yet know we have. There is a part in the book, where Priscilla is talking to her pediatrician. The doctor says "this child has been given to you, for a reason." And isn't that the case for all of us. Our children have been given to us for a reason. It might not be a reason we dreamed of, or understand yet. But for a reason. It might be in unexpected ways, but our children will exceed all the hopes and dreams we have ever had, if we will let them. Do you have any hopes or dreams that have not happened like you thought? 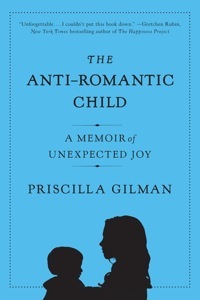 For more information about Priscilla Gilman and the book visit her website, her Facebook page, or follow her on Twitter. I was sent a copy of the Anti Romantic Child and asked to review it as part of the tlc book tour. I love this tour. It always opens my eyes to great books that help me evaluate being a wife and mother. Thoughts and opinions are all mine. The Anti-Romantic Child is a fantastic book. Heart wrenching and wonderful. Whether you have a special needs child, or just want to love your own children better, read this book. I love your comment about our children being the perfect ones for our family - I couldn't agree more! Thanks for taking the time to read and review this book for the tour. Thank you Heather! What a sweet and thoughtful review. I so appreciate your "getting" my book so well. I'm happy to "meet" you here! You have a beautiful family and a lovely blog. When my son was born it was suspected he might have spina bifida. I have never prayed so hard in my life as I did the day I was waiting for the test results. Finally after hours of prayer there was the calm reassurance of the Holy Ghost: He is perfect. He is exactly as I created him. Three years on we discovered he is profoundly deaf. This is a relatively new diagnosis and there are times I struggle with it. But those words of comfort from that day of prayer when he was a newborn are always there for me: He is perfect. He is exactly as I created him.